When I look back at 2013 I think my word for that year should have been survival. That’s just about all I think I was able to do – survive. It’s not how I wanted my year and it’s not how I want to continue in 2014. I chose the word relationship for my new year. That’s one thing that I think we’re really missing – meaningful relationships. It’s too easy to send a quick email or click the “like” button on a Facebook post. But that’s not a relationship. That’s not true friendship. It’s meaningless and shallow and sad. This year I want to connect on a deeper level. I’m going to focus on my “real-life” friends and not necessarily the online friends through blogging and homeschool groups. While I dearly love the wonderful bloggers and other homeschool families that I’ve been able to communicate with online, I want to put more of my energy into some face-to-face friendships. I’ve changed my focus for my new year…. Relationship with Christ – I want more than my casual relationship. I want to dive into a deeper level of trust and friendship. I want to draw near to the heart of Christ and hear that still small voice. I’ve missed it so often in the busyness of last year. How? I’m starting a prayer journal to write out my prayers and I’m finishing up a few Bible studies that didn’t quite get completed. Relationship with my hubby – He’s in grad school, teaches some classes, and works full time. I try to keep up with homeschooling, the house, the cooking, and the kids. We need some time together. I’ve missed our times of talking and catching up. We rarely have time to just hear what is on the other one’s heart. I’ve missed our friendship. This year I want to make more time for each other and make sure that we don’t put each other last. How? We have some date nights planned and we’re going to go through a devotional together. We’re also making sure that we pray together each day. 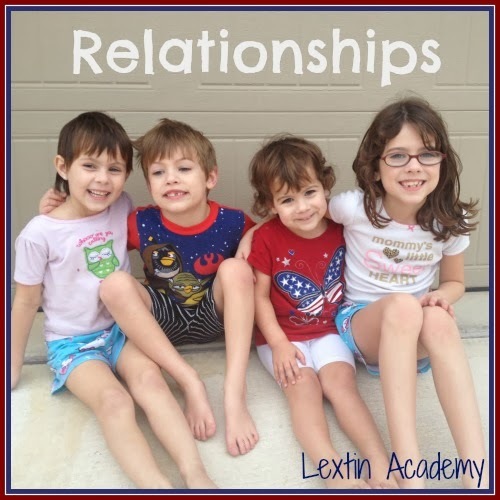 Relationship with my kids – We have 5 kids ages 8 and under. Life is crazy. But I want to make sure that I have time with each of them to listen to them, to enjoy them, to play with them, to explore with them, and to disciple them. I don’t want anyone to get lost in the shuffle. I want to build a deeper relationship with them now – one that we’ll always share even when they’re grown. How? I’m going to plan some date nights with the kids and other fun activities to do one-on-one. We’ll also have more down time, days off, and time to just relax and enjoy each other. Relationship with family – None of our family lives close to us so we have to be creative. I want my kids to continue to build on the relationship they have with family. We have such a wonderful and supportive family and I want my kids to cherish the memories of fun times together. How? We have trips planned to visit them or for them to visit us. We’ll also have to be more diligent in scheduling some Skype chats and sending cards and artwork to them. Relationship with friends – When you have kids and they have kids and there are schedules to try to balance it can be very difficult to plan a time to get together with other families and friends. Once I had a play date planned with a friend and it was rescheduled 6 times. It’s tough to find time sometimes! But I want to build friendships with the other families that we’ve met and started getting to know. I want those friendships for my kids but also for my husband and me. How? I’m going to keep planning and trying to organize play dates. We plan to have dinners out with adults friends and game nights for when the entire family is invited to our house. I’m going to keep our schedule open so that we have time to build those friendships. This year is about going beyond acquaintance and doing more than “liking” status posts or sending quick email updates. This year will be about building relationships and getting to know the heart of Christ, my family, and my friends. See what words the rest of the Crew has chosen to inspire them for a new year!